AN UNFORESEEN WEATHER EVENT IN ALBERTA RESULTED IN THE COSTLIEST NATURAL DISASTER IN CANADA’S HISTORY. June 19, 2013, began as a normal day in southern Alberta, Canada. However, developing weather patterns suggested that conditions were about to change. Calgary, the third largest city in Canada, was experiencing heavy spring rainfall, which was not unusual for that time of year. What Albertans didn’t realize at the time, was that the elements of a perfect storm were about to collide. A low-pressure system overstayed its welcome during a time of year when the ground was already saturated, and heavy snow was poised to make its yearly trek down the mountains and swell area rivers. What began as an unassuming weather event would soon result in the costliest disaster in Canadian history. FortisAlberta is an electricity distribution company serving more than half a million customers in Alberta. Although the city of Calgary is not a municipality served by FortisAlberta, the company is headquartered there, just nine blocks from the Elbow River. The Elbow is one of two rivers flowing through the city that would eventually crest several times above normal flow rates and force people from their homes in nearby communities. When Calgary officials ordered the mandatory evacuation of downtown businesses and residents on the afternoon of June 20, FortisAlberta had only a couple of hours to execute an evacuation plan for its employees who worked in the head office. Upon evacuation, the distribution company enacted its BCP at a Level 3 status, and identified critical employees whose workstations needed to be relocated from the Calgary head office to an office building outside the flood zone in nearby Airdrie. The Airdrie office houses FortisAlberta’s call centre and other departments. As downtown Calgary was evacuated, members of FortisAlberta’s information technology and facilities departments provided critical, logistical support so that relocated employees could carry out essential business functions in the days to come. The flooding began in the foothills to the west of the city, and quickly impacted communities south of Calgary, including the Town of High River. It quickly became apparent that FortisAlberta also needed to enact its Outage Restoration Management Plan (ORMP). It was the first time in the company’s history that it had to activate both its BCP and ORMP simultaneously. It proved to be one of the largest operational challenges ever faced by FortisAlberta. FortisAlberta’s ORMP is based on the Incident Command System adopted internationally by military, police, fire and many other organizations. It enables employees to react to emergency situations that result in unplanned power interruptions in a safe and effective way. Through its ORMP, the company works to ensure that all employees are equipped with the tools and knowledge to help customers and to restore power as quickly and safely as possible. Level 1 – Multiple outages in one service point that require additional resources to manage, but which can be restored within 24 hours. Level 2 – Multiple outages, possibly in multiple service points, that will require additional resources from other service areas, and which may take several days to restore. Level 3 – Multiple Service areas are without power, likely including major transmission damage and the requirement to bring in Mutual Aid Partners from outside of Alberta. Maintaining an open and close working relationship with the authorities in charge, anticipating their needs and remaining flexible were keys to success. Upon implementing its ORMP, FortisAlberta declared a Level 2 event. 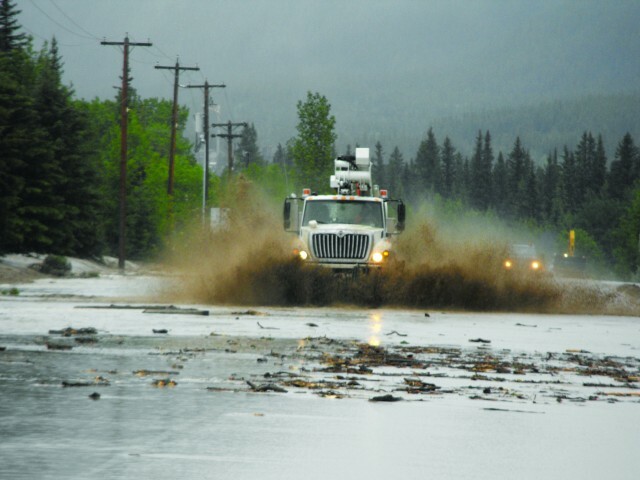 In total, the flood caused more than one million hours of interruption to FortisAlberta’s customers in affected areas including Black Diamond, Bragg Creek, Canmore, Exshaw, Hidden Valley, High River and Siksika First Nation Reserve land. Ninety percent of customer interruption hours caused by flooding within the company’s service territory occurred in High River. Most other communities were restored within 48 hours of the initial events. After June 22, restoration efforts were focused almost entirely on High River. Flood damage was contained to the company’s south region and the event remained at Level 2 throughout the flooding period. The most significant property damage occurred in High River, a town of approximately 13,000 people, located 45 minutes south of Calgary. As flood waters from the Highwood River overtook the town, some immediate challenges were presented. While it wasn’t yet clear if the water would overtake the FortisAlberta High River office location, with streets flooding only a couple of blocks away, the company moved its trucks to higher ground as a precaution. During this time, the local team lost landline and cellphone communication after one of the major carriers went offline due to the flooding, and workers had to use satellite phones as their primary means of communication. During the first hours of the event, FortisAlberta established communications lines with key agencies, first responders, other utilities, municipalities and media. Throughout the event, customers and media were updated through social media and a specific flood restoration page on FortisAlberta’s website. The company provided instant updates to external audiences through Twitter and updated employees through email and a pre-arranged hotline. The operational turning point, however, occurred when the company began to assess the damage to its system in High River. It found that much of its equipment in the area was filled with mud and silt, and its poles were inaccessible. It was immediately clear that the power would have to remain off for the safety of the public, its customers and its employees in the area. With the entire town evacuated and most of the property under water, the damage was so extensive that the Province of Alberta took charge of all flood recovery efforts. FortisAlberta then worked closely with the provincial Emergency Operations Centre (EOC) to develop a plan for restoration. Power Line Technicians (PLTs) accompanied law enforcement on house-to-house inspections. Following these inspections, FortisAlberta recommended that its employees sleeve every meter (disconnect sleeves, also known as meter boots, are used by electric utilities to safely isolate a meter temporarily from the electrical service). This was performed so that upon restoration, PLTs would be on site to ensure that each individual residence or business was safe to re-energize. More than 200 PLTs transferred in from other parts of the province to disconnect and secure more than 6,700 meters. The company worked with the provincial EOC on a staged approach to restore crucial facilities. For example, power to run water and sewer backup was needed to flush out the wells before any residents could return to High River. FortisAlberta’s PLTs disconnected overhead power lines individually to begin the process of restoring power to key incident command centres and hotels. In addition, crews opened every transformer, and washed and hydrovaced each piece of equipment to return it to top form. The company wanted to ensure that when customers returned to their homes, a blown transformer or cable did not hinder their cleanup efforts. Second to safety, the company’s priority was to ensure that it did not stand between its customers and their next steps toward putting their lives back together. The provincial EOC divided the town into different sectors as part of a staged approach for re-entry into the community. Both the company’s automated metering system and Geographical Information System provided critical information to the provincial EOC. FortisAlberta generated a map of the flood-impacted area that showed the water’s recession. It was overlaid with one demonstrating the distribution company’s restoration progress. This information was shared daily with the provincial EOC and other utilities to coordinate restoration activities and monitor progress. The provincial EOC developed a colour-coded system to help people understand the state of their home. Some customers could return to minor cleanup and repairs, while others learned that their homes were condemned. If power could be restored safely, customers received a sticker to be placed in their front window. FortisAlberta established an active presence during the re-entry of residents after the evacuation order was lifted in High River. Customer service specialists engaged with customers at the High River re-entry centre, a gathering point for residents as they learned more about the status of their home before returning to it. FortisAlberta employees provided information about the process for the safe reconnection of electricity service and worked alongside the Red Cross, the gas company, telecommunications representatives and others to coordinate re-entry efforts for High River customers. Employees placed door-knocker information sheets at every home and business before customers returned, providing them with information and instructions on how to get their power restored. As residents re-entered their homes, PLTs were stationed in various neighbourhoods, in some cases on street corners, so that they could respond quickly to customer needs. More than 850 services were restored on the first day of re-entry. Technicians were assigned to different segments within the town where they would speak with customers, secure the appropriate paperwork from the customer package and restore power. The company’s goal was to restore customer’s power immediately whenever possible. More than 100 employees volunteered their time and energy to assist customers and co-workers to remove possessions, debris, silt and water from people’s homes. It was a massive effort. From assessment to restoration, each home and business was visited a total of four times by FortisAlberta employees. FortisAlberta quickly mobilized a large number of employees from points across its service territory to assist with restoration efforts. In addition, the generous spirit of FortisAlberta employees was apparent and acknowledged through customer feedback and by other stakeholders. Employees, many of them volunteering their time, worked tirelessly in difficult conditions to assist customers and fellow co-workers. The devastation caused by this flood was unprecedented, and so was the working relationship between FortisAlberta and the province. Maintaining an open and close working relationship with the authorities in charge, anticipating their needs and remaining flexible were keys to success. Safety was always the number one priority. Even though it required more manpower, sleeving each meter and restoring power to each individual residence as customers returned was the best way to ensure the safety of everyone involved. The company’s safety department also quickly assessed the unique risks faced by employees during this event. They provided the proper training, equipment and decontamination processes to ensure the health and safety of its employees. Each morning during restoration, the company held meetings in High River to discuss restoration progress and the plan for that day. This allowed FortisAlberta to address issues and adapt its course of action if required. From a human resources perspective, FortisAlberta anticipated the needs of its employees who were affected by the flood by providing time off, assistance with cleanup and access to various support resources. Several areas were not accessible to FortisAlberta crews for days due to extensive flooding, and destroyed bridges and roads. In response, FortisAlberta has now redesigned 27 power line river crossings. The changes include installing a higher-class pole, set deeper, and located as far away from the flood plain as possible. The lingering presence of water in flooded communities increased potential health risks, such as exposure to E. coli bacteria, something not faced before. FortisAlberta’s safety department provided employees with necessary training and personal protective equipment. They also developed a rigorous decontamination procedure where clothing, trucks and facilities were kept clean at all times. Portable toilets, hand-washing stations, drinking water and catering were brought in from neighbouring towns for local office staff, as potable water was not available in town. FortisAlberta’s distribution control centre, which also houses its Outage Management System, was under construction during the flooding and became operational in 2013. With overall system visibility now at a central location, new processes and techniques are now employed that will enhance system reliability and customer communication for future power restoration and other extreme weather events. FortisAlberta lost all communications capability due to the loss of power to the area’s main telecommunications service provider. The company worked closely with the telecommunications provider to identify critical sites in its service territory, and in turn they developed key processes and established lines of contact to ensure that these sites have top priority during restoration efforts. The 2013 flood event has had a lasting impact on FortisAlberta. There is still work to be done as some employees and customers continue to rebuild their homes and communities. There were several important operational lessons learned from this event, but as the PLTs in High River might tell you, the most significant impact from a business perspective has less to do with keeping the power on, and more to do with how FortisAlberta employees and customers came together to support one another. Alana Antonelli is the manager of corporate communications for FortisAlberta. In her reputation management role, she oversees the company’s crisis communications strategy, digital and customer communications, community investment, and media relations. 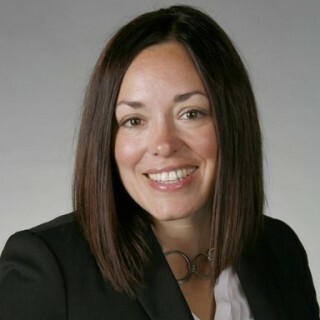 She has more than 18 years’ experience in marketing and communications, and holds a Bachelor of Commerce degree from the University of Calgary.